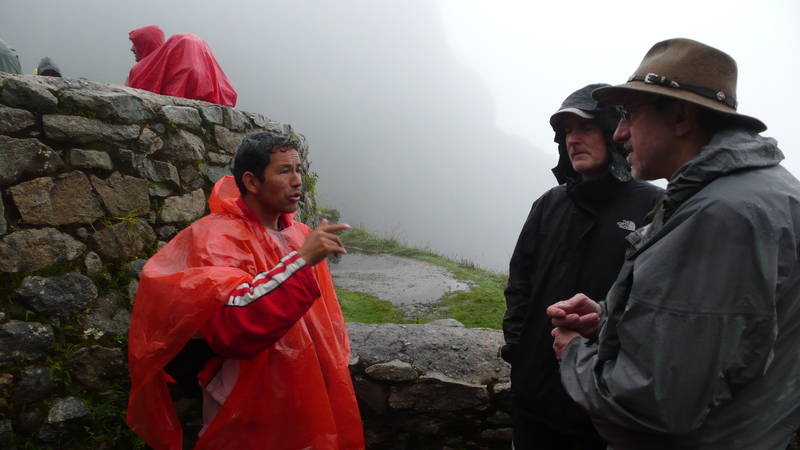 January 22, 2010 CAMP PACAYMAYU, PERU The rain came in the night, lightly at first. 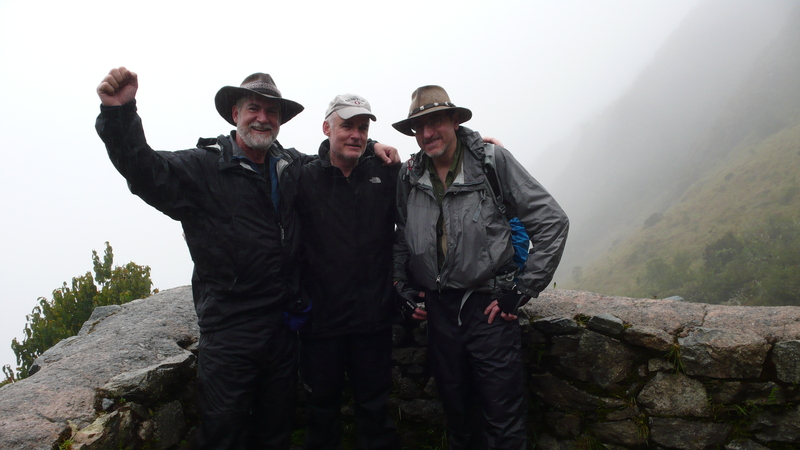 By what should have been dawn, it was raining heavily and darker than usual. 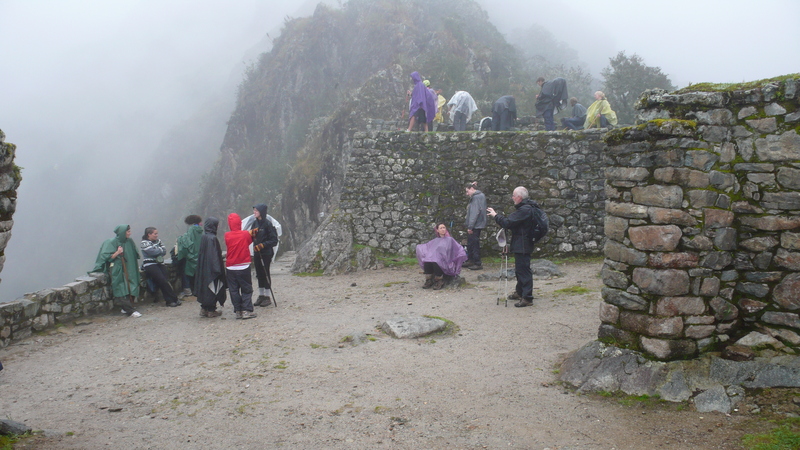 The porters brought the warm water, towels and soap dishes to each of us to clean up shortly after the wake-up call; then, followed up with a cup of hot coca leaf tea, mine with a spoon of sugar and flavored with a bag of black tea, while we were packing up our things and getting dressed for the day. The routine was becoming routine. 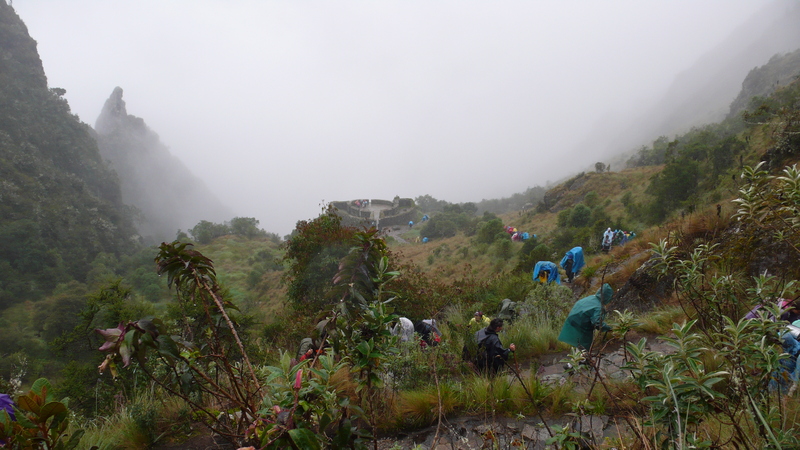 Here, at the high-jungle camp of Pacaymayu (11,700 feet 0r 3,580 meters), the black mud was everywhere. 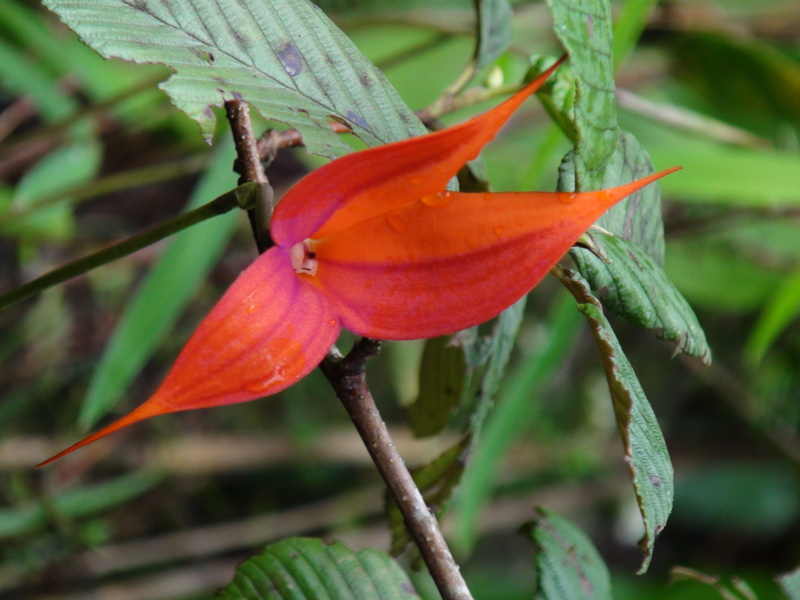 Trying to keep it from becoming a part of your clothing for the day or, worse, part of the sleeping bag, was a major challenge …as the boots in the fly outside the tent entrance had to be put on, and the rest of the gear packed or worn to breakfast. Jim had taken advantage of the cold water showers in camp the night before, so he had more of a horse in this race than I did. Hands, fingernails and face were my priorities to keep clean…the rest would take care of itself when we got to a different place. Etzold getting a glimpse outside the tent to start the day....Pacaymayu Camp, with waterfalls roaring into the valley from above. Another hot, delicious meal greeted us in the mess tent, which took some of the edge off the rain coming down outside. 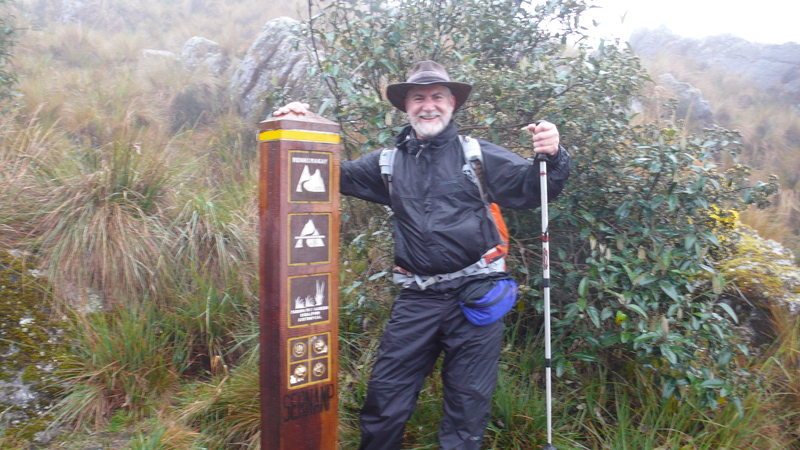 Julian described the trail today, and didn’t say much about the first section, that steep mountain pass disappearing into the clouds across the valley from our campsite. That worried me a little, though I didn’t say anything. Runkuraqay was another very high pass (13,123 feet or 4,000 meters), and yesterday’s ascent of Dead Woman Pass was still very real to my leg muscles. 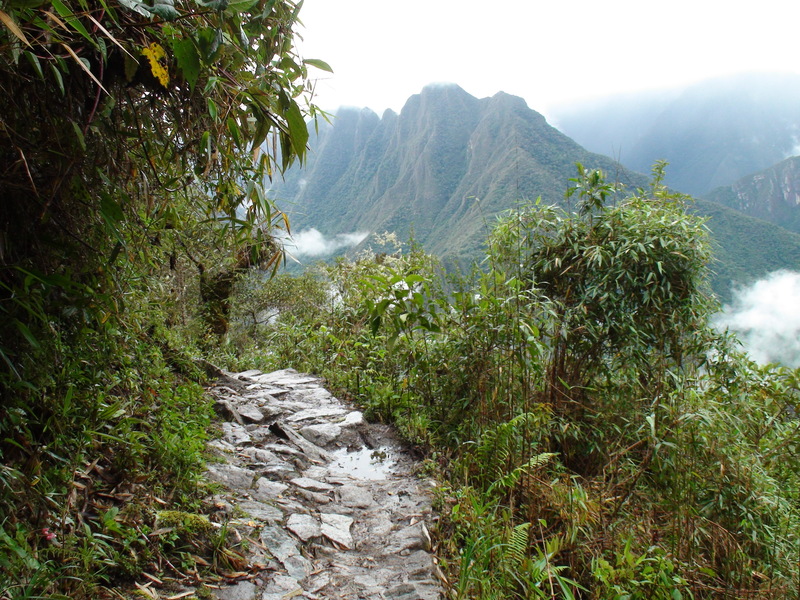 What Julian described, though, was a long 18-kilometer day of hiking with good Inca ruins and tunnels to visit as we walked along a high mountain ridge line, and then a descent to our night’s camp at Winay Wayna…where hot showers and cold beer awaited us! Now, there’s a good incentive for us! What I didn’t realize at the time were two things: first, the 1,400-foot ascent was so steep, and we were starting so high, that it would take two hours of hard climbing to get to the top; second, there’s a false summit up there…which saps your excitement and dashes your strength on the rocks! 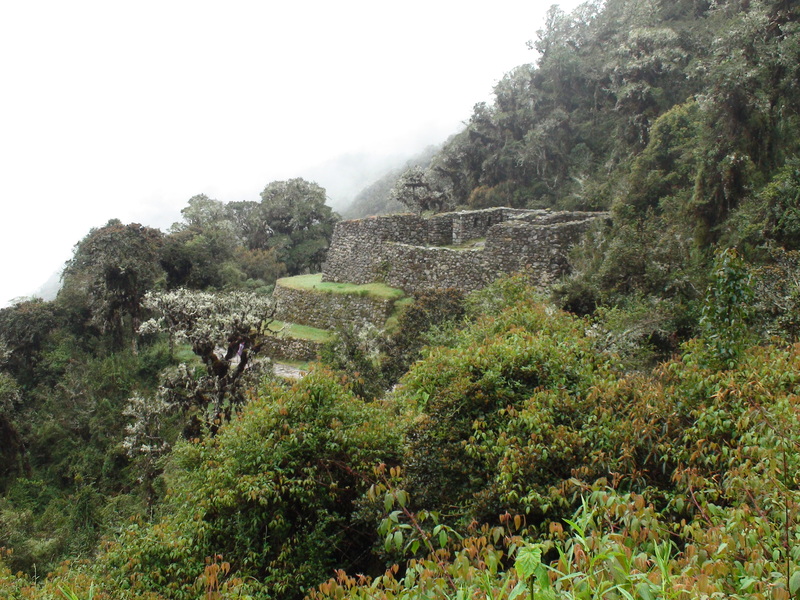 The good news is that about half way up there is a very fine little Inca Ruin of the same name as the pass (or maybe its the pass that’s named after the ruins), which has been nicely restored and is a great rest stop for photos. 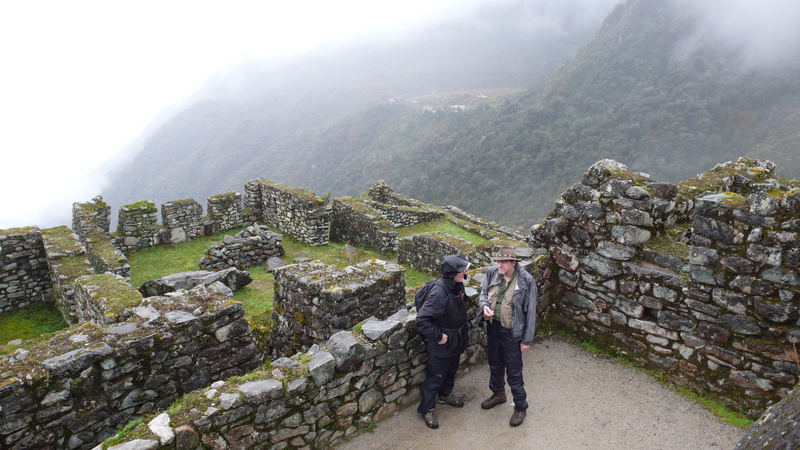 It was a “tambo” or way-station for messengers and travelers along the Inca Trail some six hundred years ago. 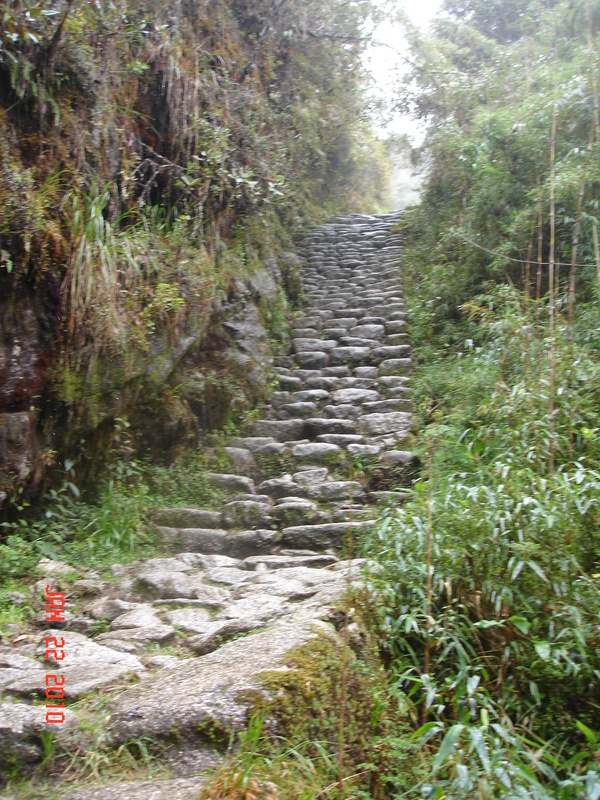 Mercilessly, the steep trail continued on upwards, the top of the pass never really visible due to the fog and constant rain. There are some groups who hike over Warmiwanusca and Runkuraqay Passes both in one day…a thought that I couldn’t grasp then, and still cannot. 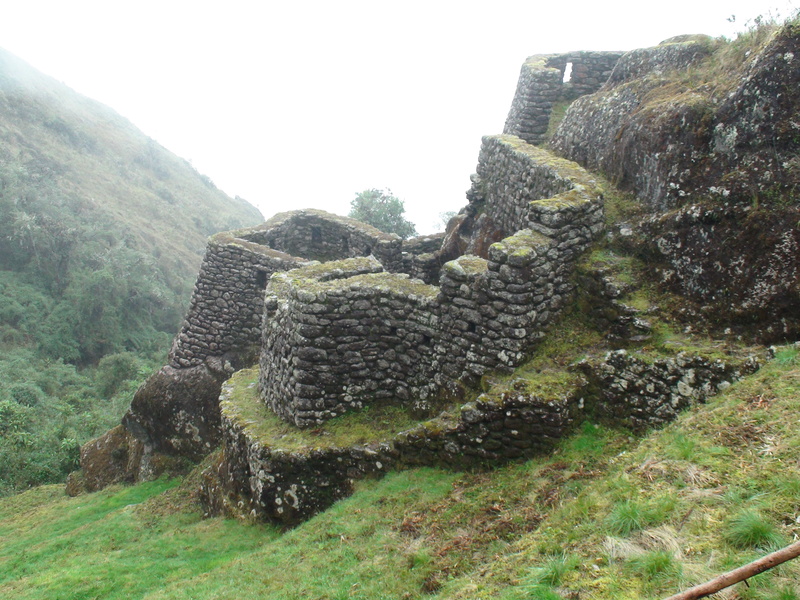 Supposedly, it allows a more leisurely third day hike, and more time to explore the two ruins at Winay Wanya. 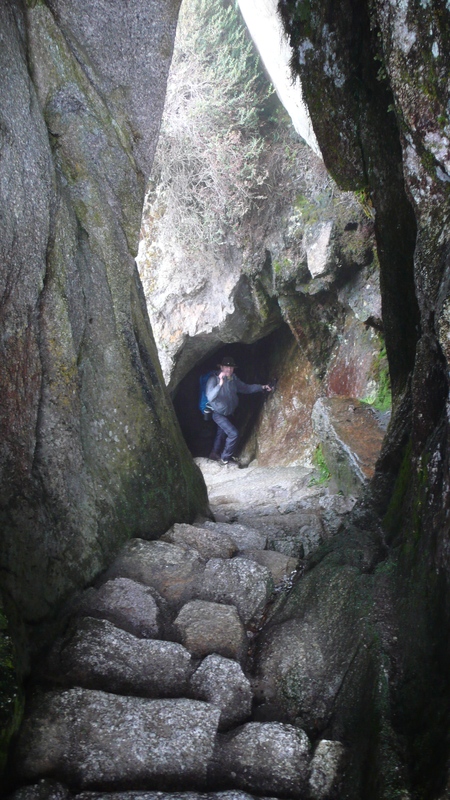 I am convinced that Julian, with his experience, chose the correct pacing for our group. 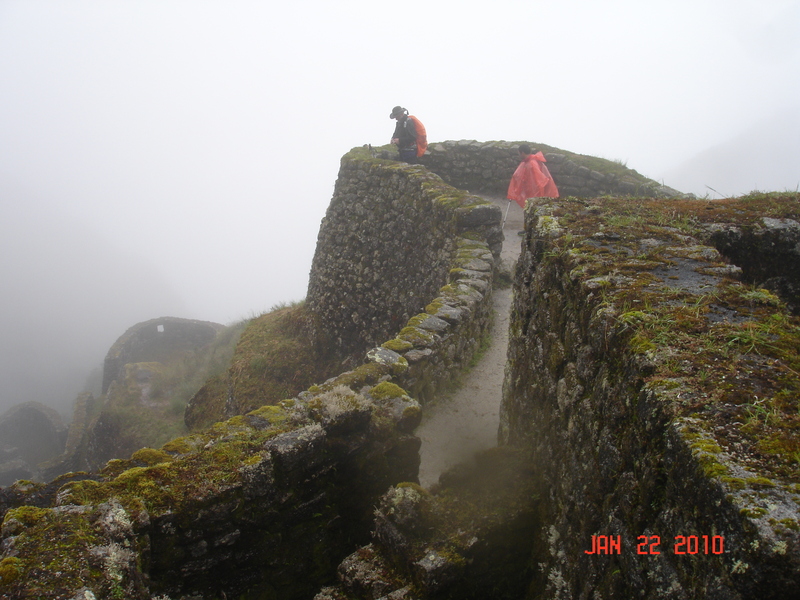 Not more than thirty minutes walk down the back side of the Runkuraqay summit, one of the finest set of Inca ruins on the trail sits atop a ridge up to the left: Sayacmarca. 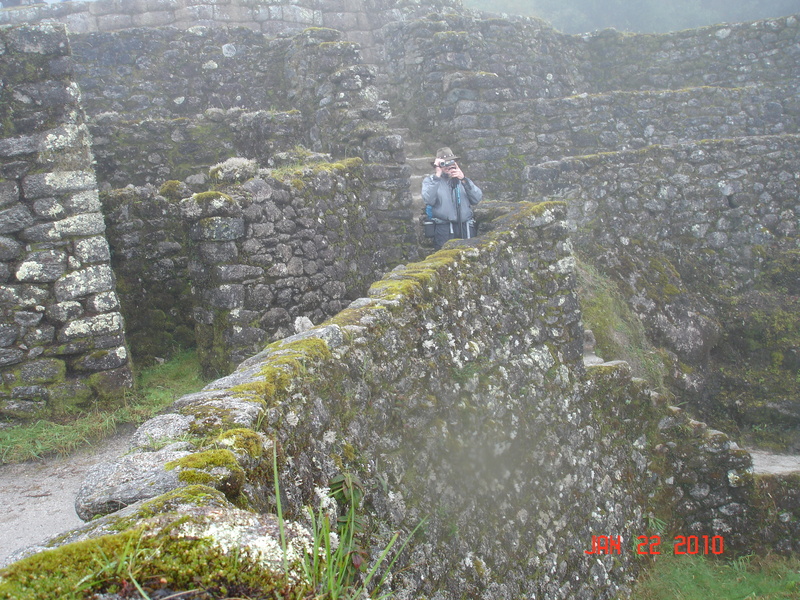 This combination fortress, way station and observatory has a number of exquisite features: an elaborate water channel system to several interior fountains, beautiful large rooms using combinations of native rock and imported stone, many windows and beautiful doorways, and plazas for feasts or celebrations. 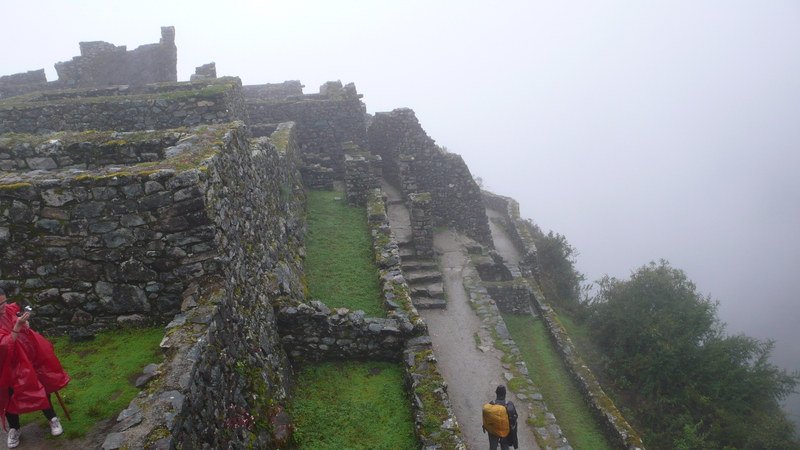 A very steep staircase ascends from the Inca Trail, and is certainly a defensive structure! 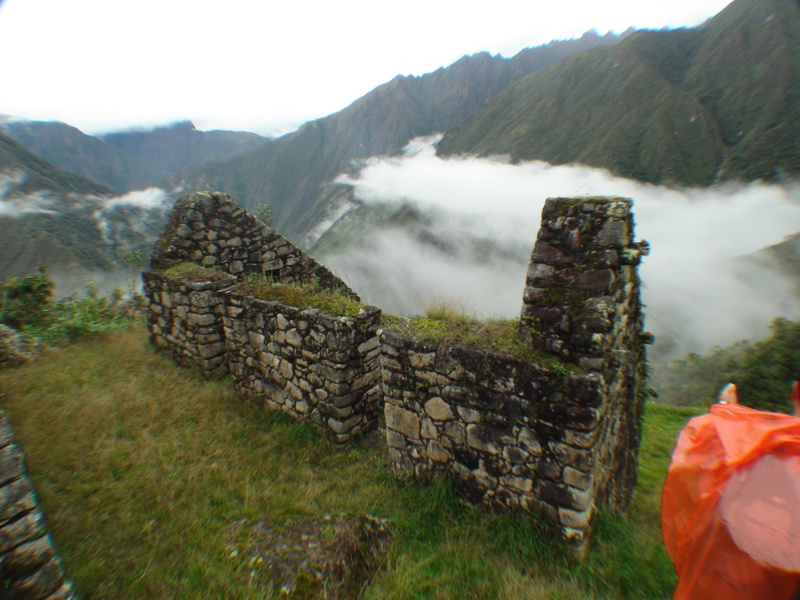 Across the valley and below are seen other ruins, more like storehouses and tambos. 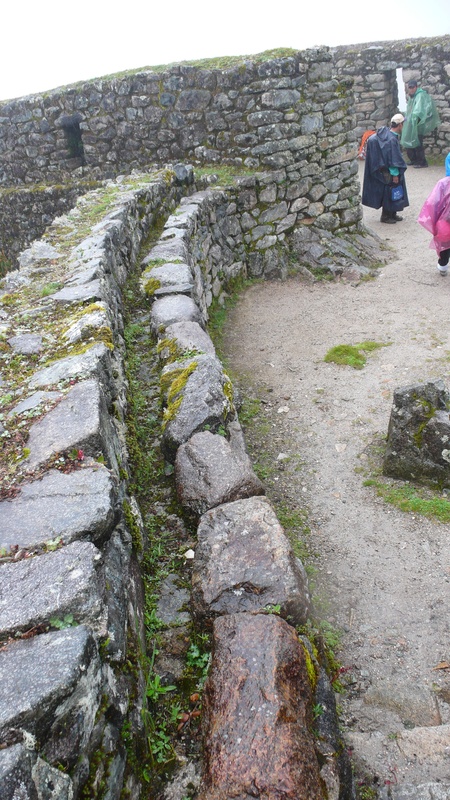 Inca Water Channel system on top of walls, delivers by gravity flow to a series of fountain rooms. 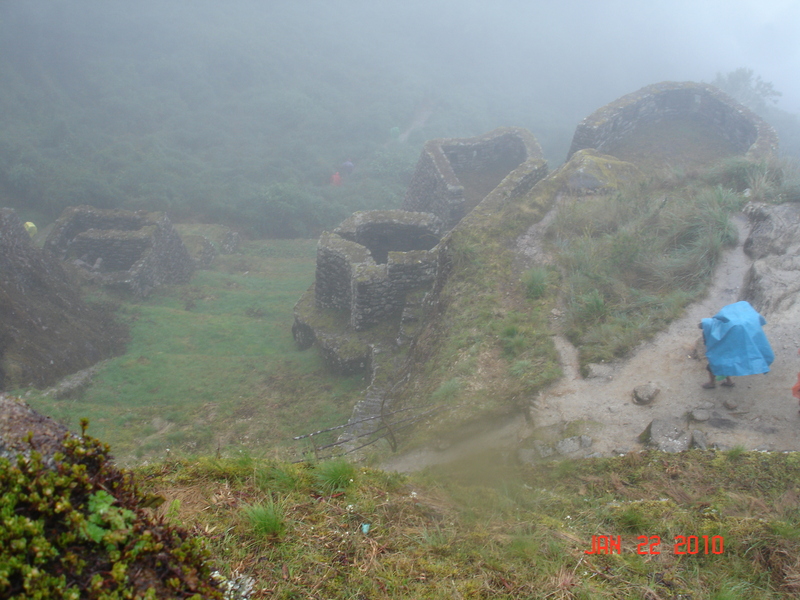 We continue the hike, descending those steep stairs to the trail, and crossing over the other side of the mountain ridge, passing the smaller ruins along the way, to our right. 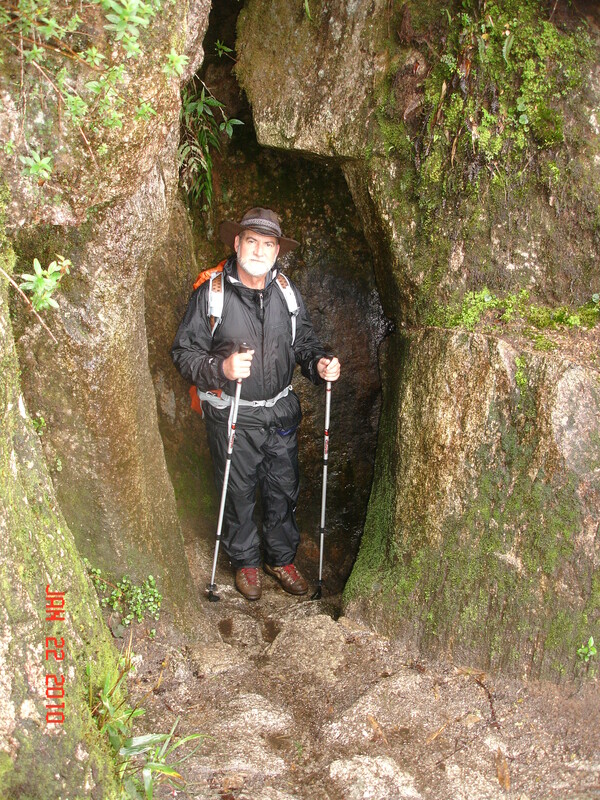 ...and our first Inca Tunnel! 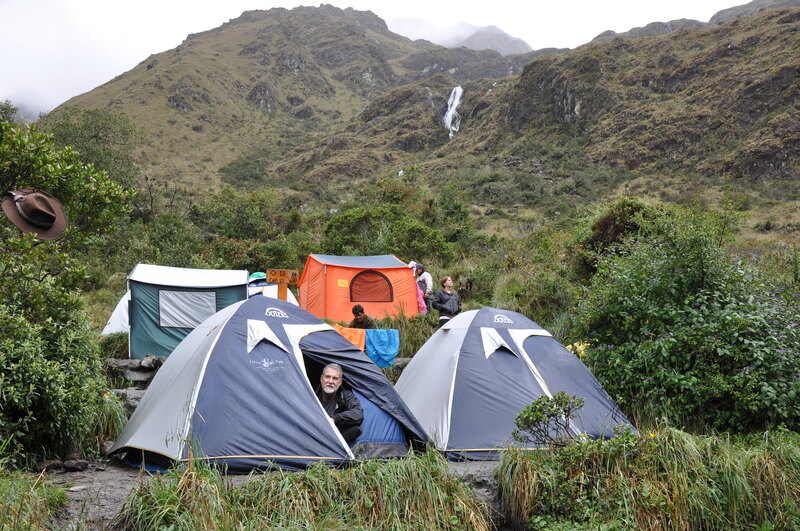 We stop for lunch at the mess tent set up by our porters and enjoy a dry respite and some more superb food prepared by Cecilio. 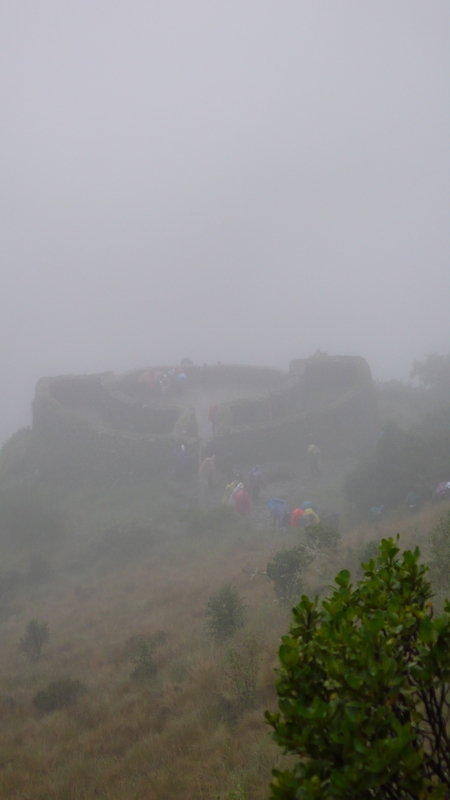 It has been raining all day, alternating between a drizzle and a strong downpour. 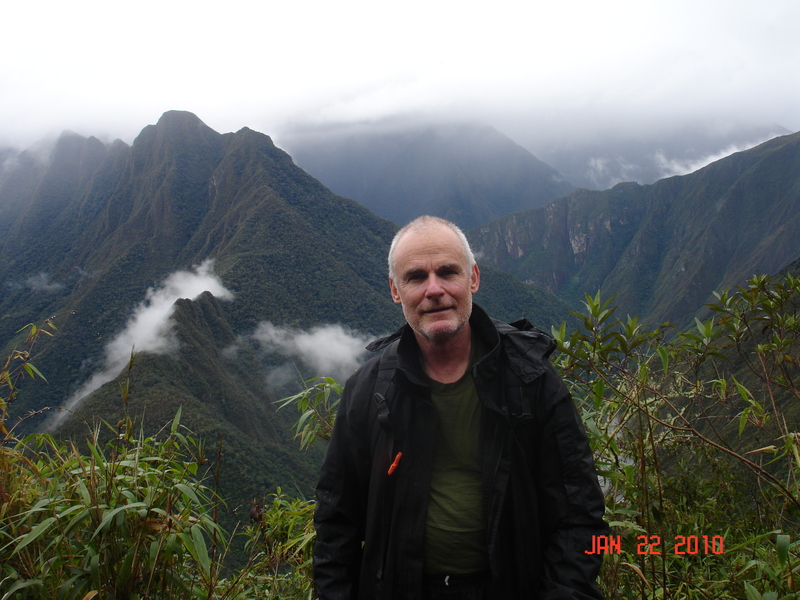 The lunch stop is a hilltop locations, called Chaquicocha, where Julian assures us the views are magnificent of distant snow capped peaks and deep valleys…we take his word on faith! 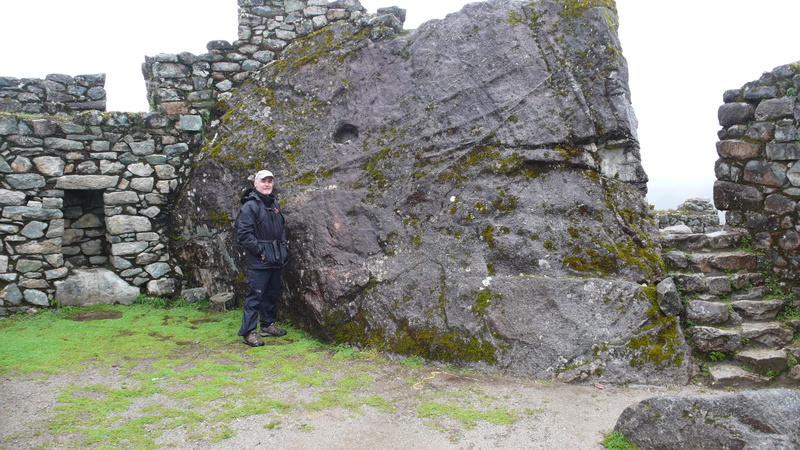 It’s still raining as we set out for the next big ruin and what turns out to be a memorable lecture by Julian on the significance of the “Inca Cross” symbol…at Phuyupatamarca. 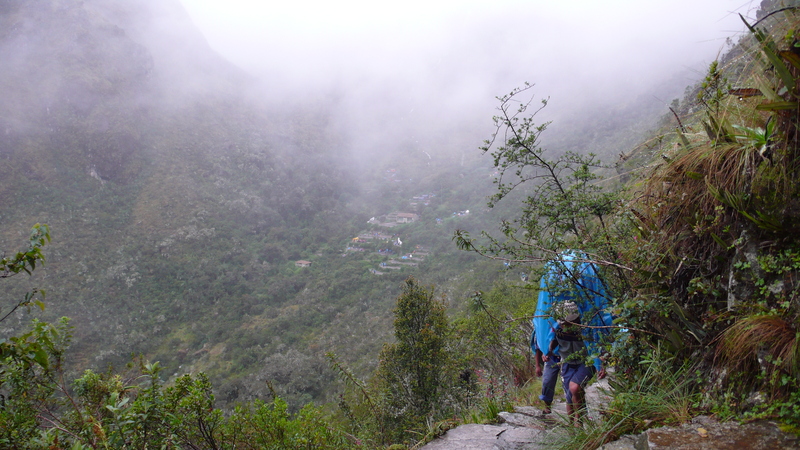 The trail winds it’s way through a beautiful lush cloud forest jungle as we left the lunch camp and slowly and gently ascends what is called the “third pass” of 12,073 feet (3,680 meters), just before arriving at Phuyupatamarca. 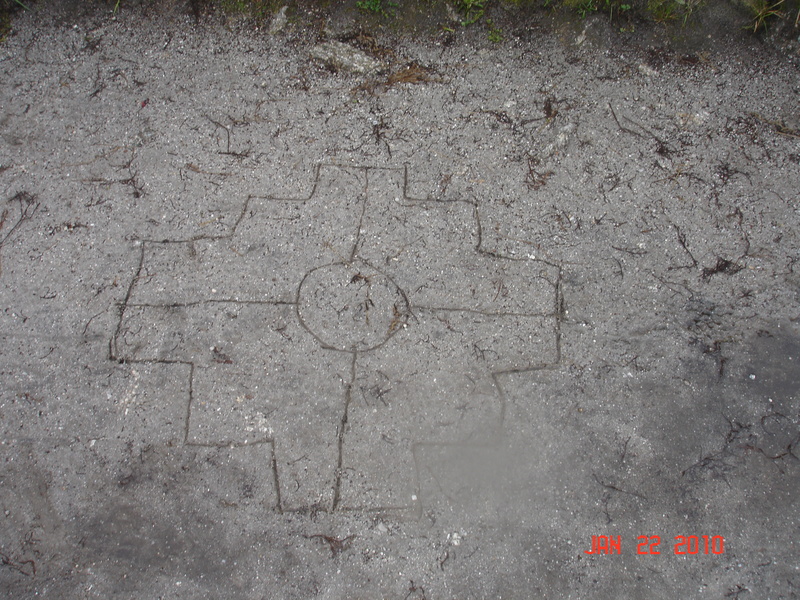 The "Inca Cross" scratched into the ground by our guide, Julian, to illustrate the next discussion and lecture in this mysterious setting. 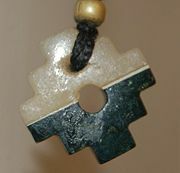 The Chakana (or Inca Cross) symbolizes for Inca mythology what is known in other mythologies as the World Tree, Tree of Life and so on. 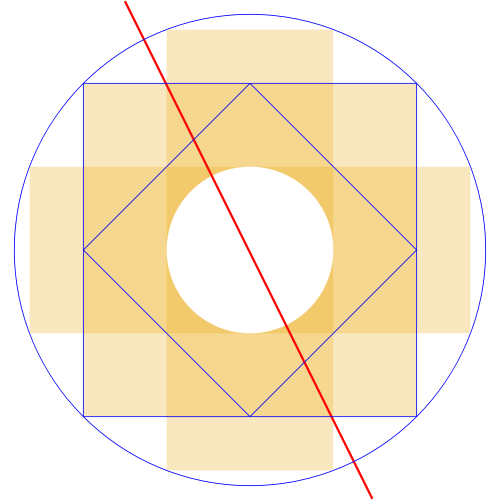 The stepped cross is made up of an equal-armed cross indicating the cardinal points of the compass and a superimposed square. The square represents the other two levels of existence. 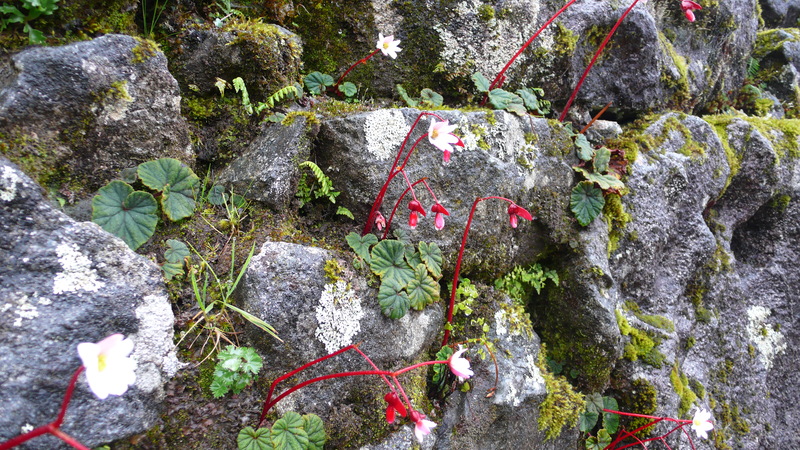 The three levels of existence are Hana Pacha (the upper world inhabited by the superior gods), Kay Pacha, (the world of our everyday existence) and Ucu or Urin Pacha (the underworld inhabited by spirits of the dead, the ancestors, their overlords and various deities having close contact to the Earth plane). 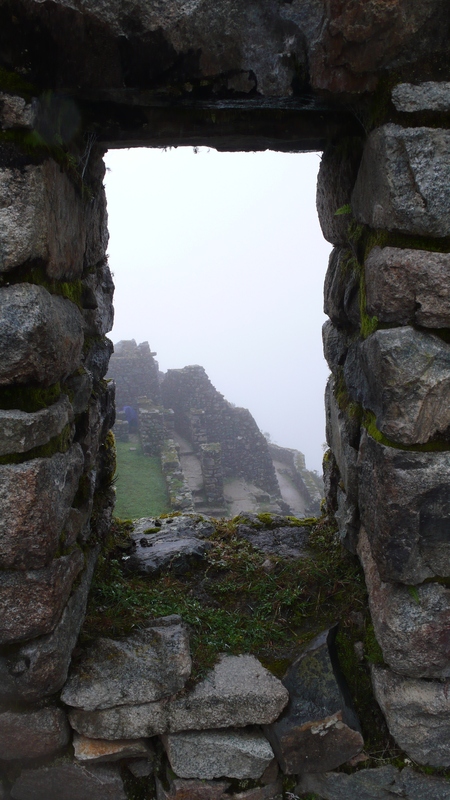 The hole through the centre of the cross is the Axis by means of which the shaman transits the cosmic vault to the other levels. 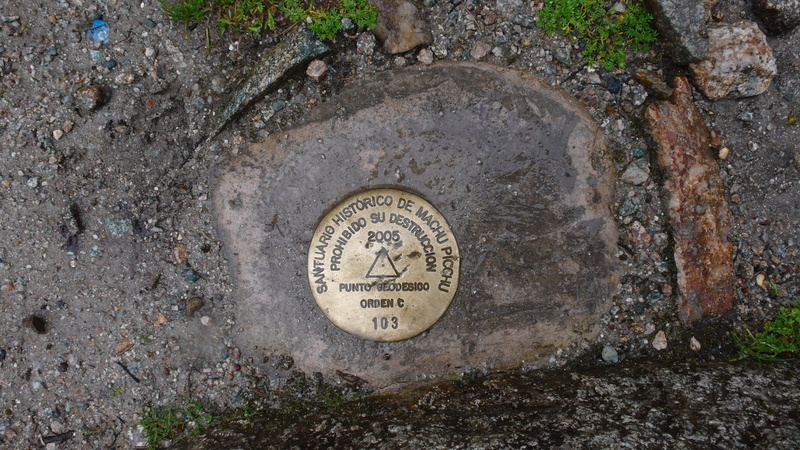 It also represents Cuzco, the center of the Incan empire, and the Southern Cross constellation. 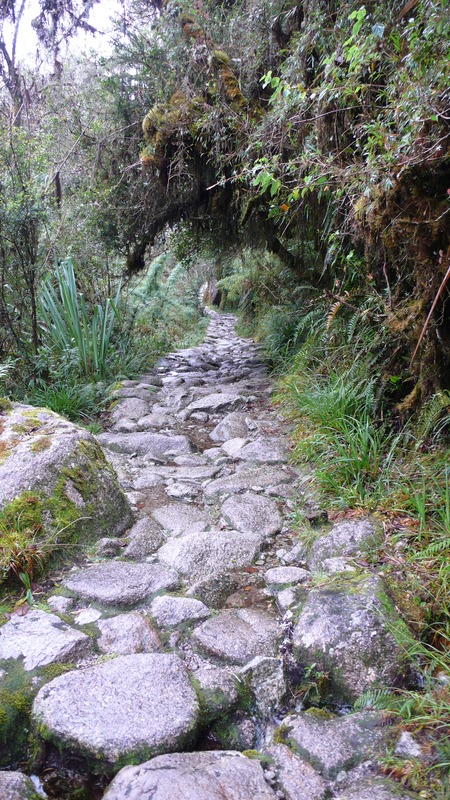 Through a central axis a shaman journeyed in trance to the lower plane or Underworld and the higher levels inhabited by the superior gods to enquire into the causes of misfortune on the Earth plane. 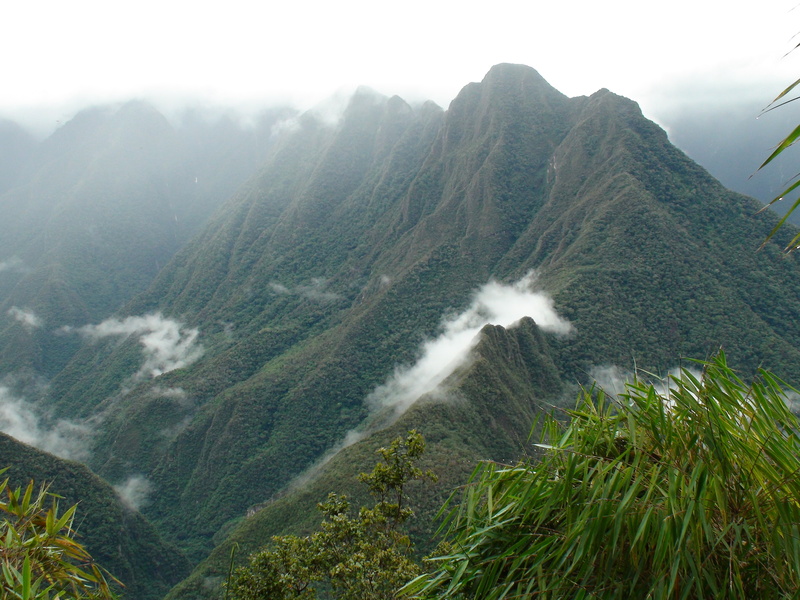 The snake, puma, and condor are totemic representatives of the three levels. 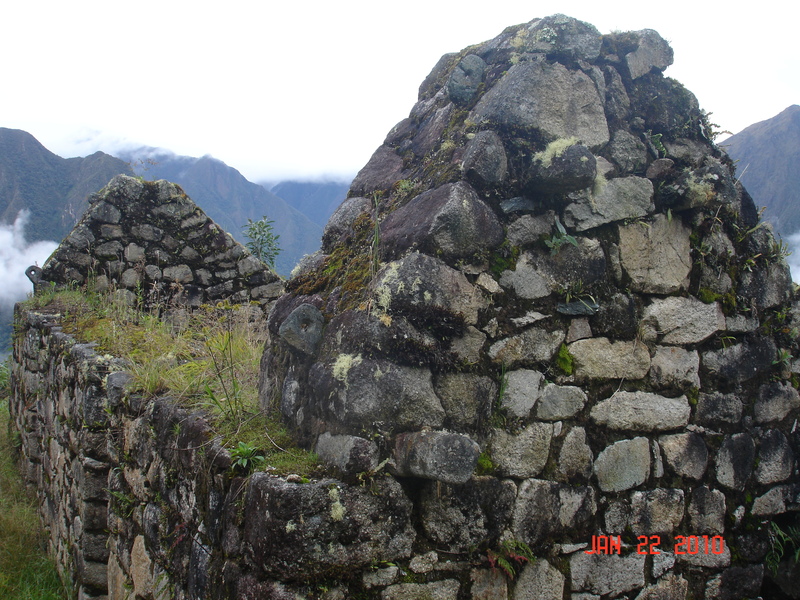 *Knowledge (Yachay): The forms of intellect, experience, and consciousness. * Work (Llankay): Productive, communal labor. 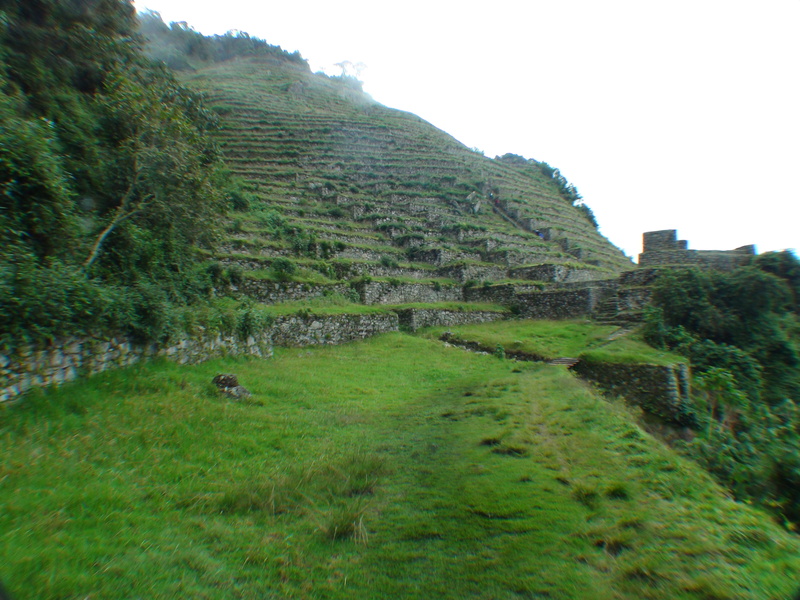 Specifically, the division of labor and aportionment of the harvest across the village, imperial and temple levels. 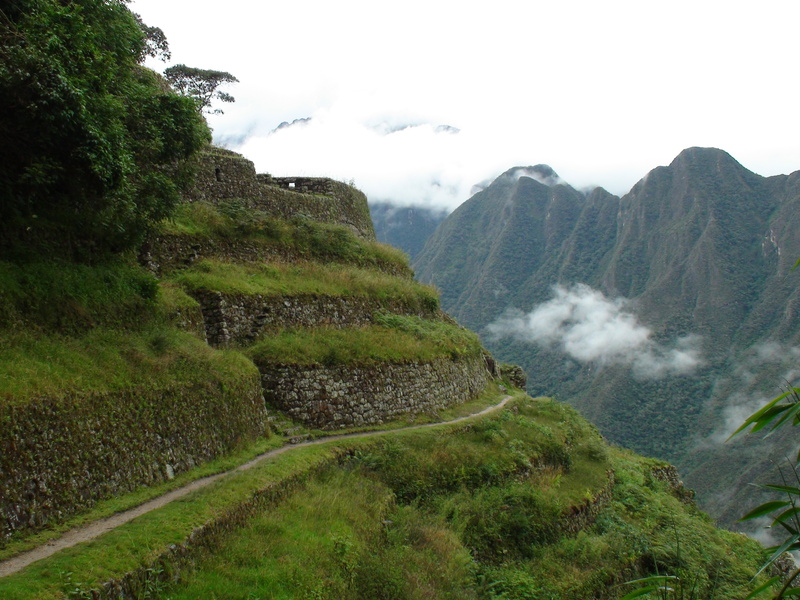 We found the Inca Cross embedded in the art and culture around us after this lecture…in the weaving, in the jewelry, the pottery and even in a huge stone we found at Machu Picchu! 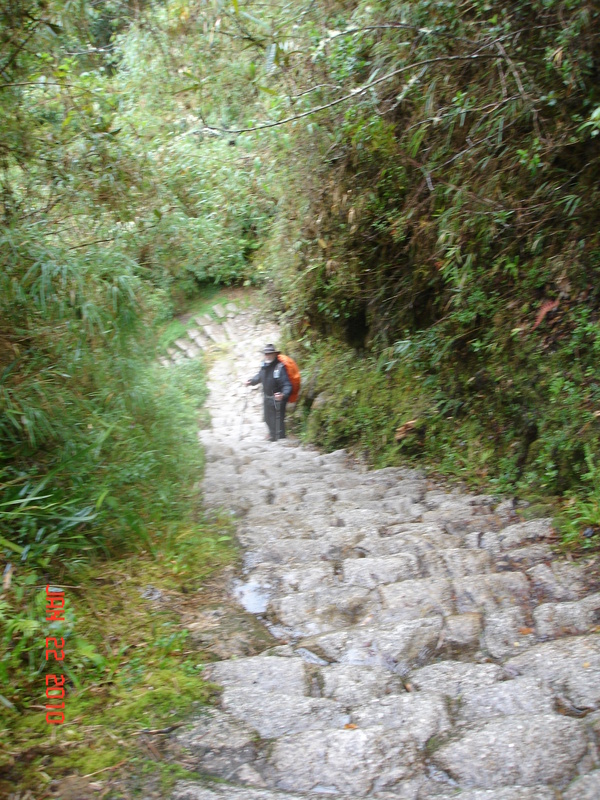 The trail takes a steep descent from this point, following a series of very well built granite steps through the high rain forest…..
Inca staircase....an hour of this or more! 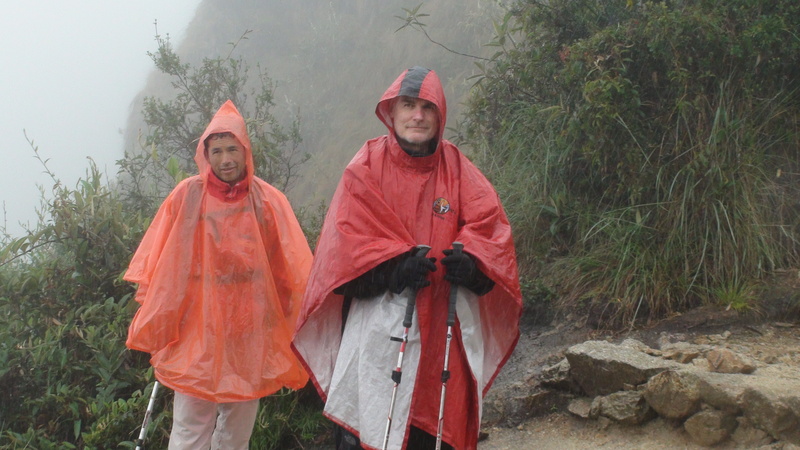 Here, the weather began to lift for the first time in the day, about 3:30pm…and the views of the mountain ranges and the Urubamba River far below were breathtaking! 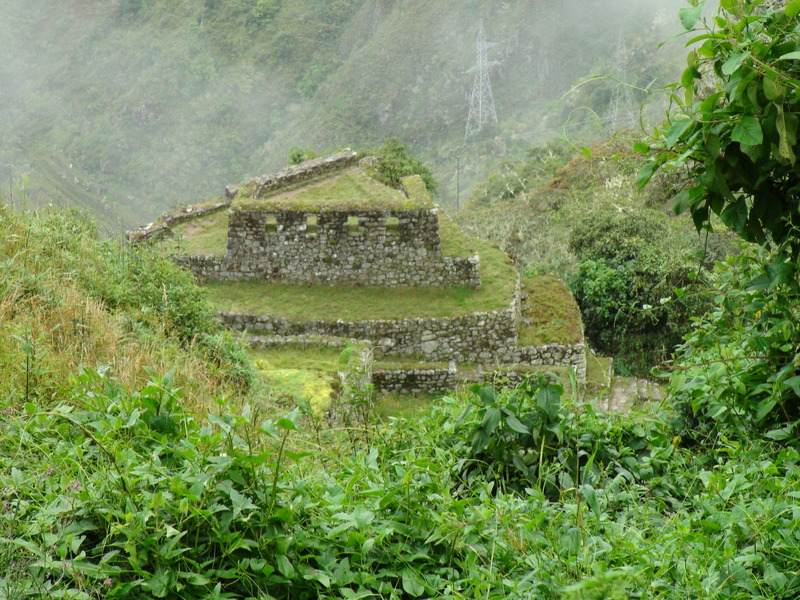 Another hour of hiking and we’d be near the final night’s camp Winay Wayna, and some nearby ruins called Intipata, which was an agricultural complex supporting Machu Picchu. 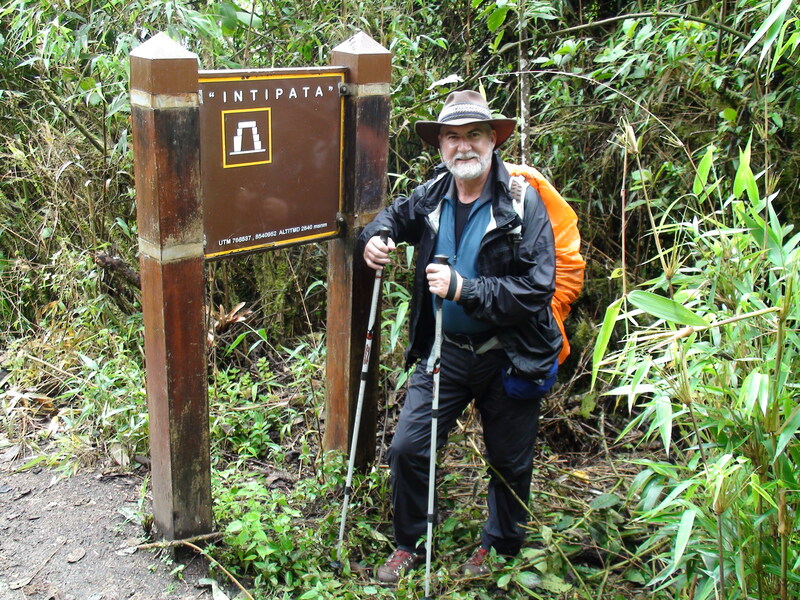 …and finally a short, gentle hike to the campsite…too weary to record any photographs! 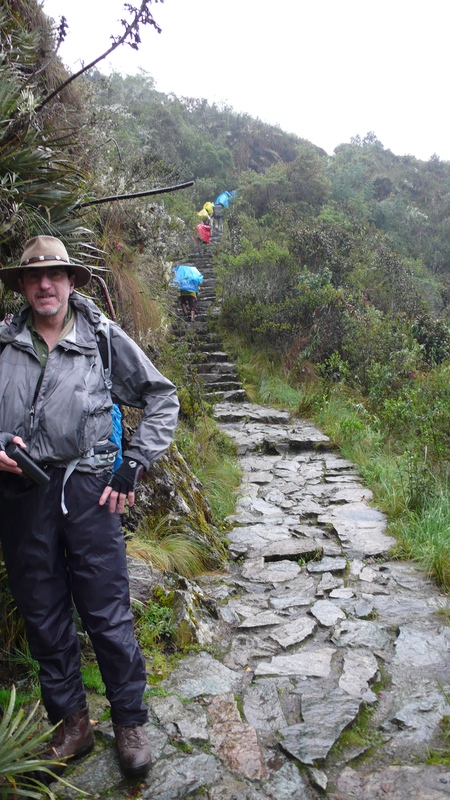 A good day of hiking behind us, too much rain and one mishap with Etzold’s camera at the Inca tunnel would be soon eclipsed by the main event…the early morning hike to the Sun Gate and into Machu Picchu at sunrise! Please let us have a day of nice weather tomorrow! 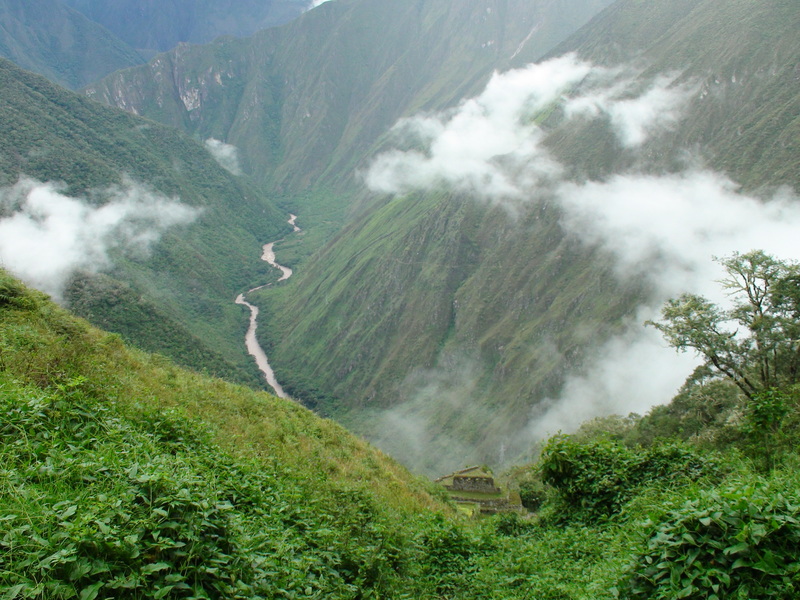 ...a beautiful view of the Urubamba Valley as we hike to our final night's camp!